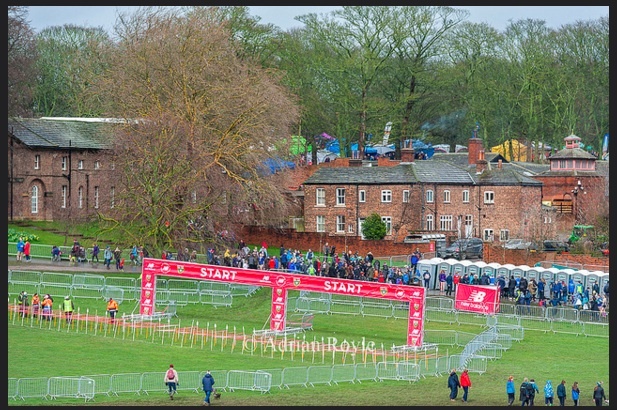 Temple Newsam in Leeds again played host to the English Schools Cross Country Championships, sponsored by New Balance. 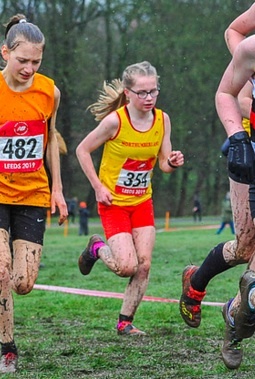 The Championships are the pinnacle of any young athlete’s career – the best from every County go head to head and the prestige of the Championships is second to none. In a recent interview, Mo Farah admitted to placing more importance on the English Schools than the National Cross Country and Inter Counties when he was a young athlete. 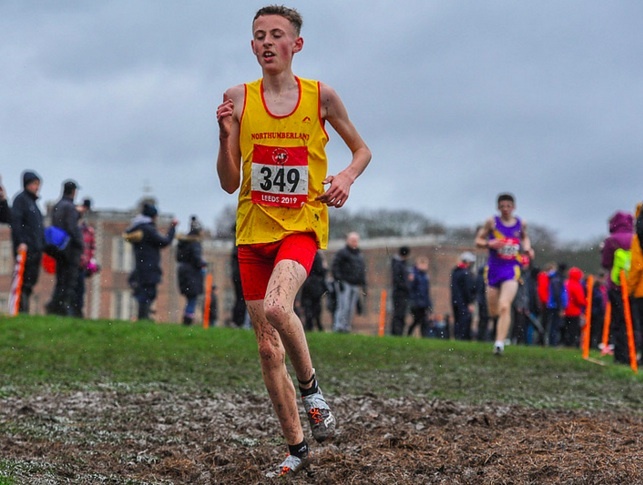 Not only were Championship titles at stake but the first 8 in the Junior and Senior races were selected to represent England at the upcoming Home Countries Schools International. 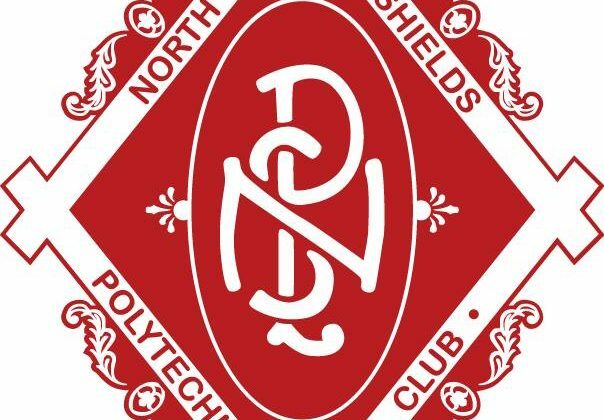 Last year the club had 5 athletes representing Northumberland and this year it was 8. To make things even better, this time we also brought back a medal! The Championships were held at the same venue as last year and twelve months ago the athletes had to deal with icy cold winds as the ‘beast from the east’ did it’s best to make things difficult. This year there was no beast but mud, rain, sludge and low temperatures were the obstacles that the runners had to deal with. The course could be described as a ‘proper cross country course’. This is sometimes an overused phrase but not this time – mud, hills, rain and wind, with an uphill start and finish to contend with, this wasn’t for the faint hearted. 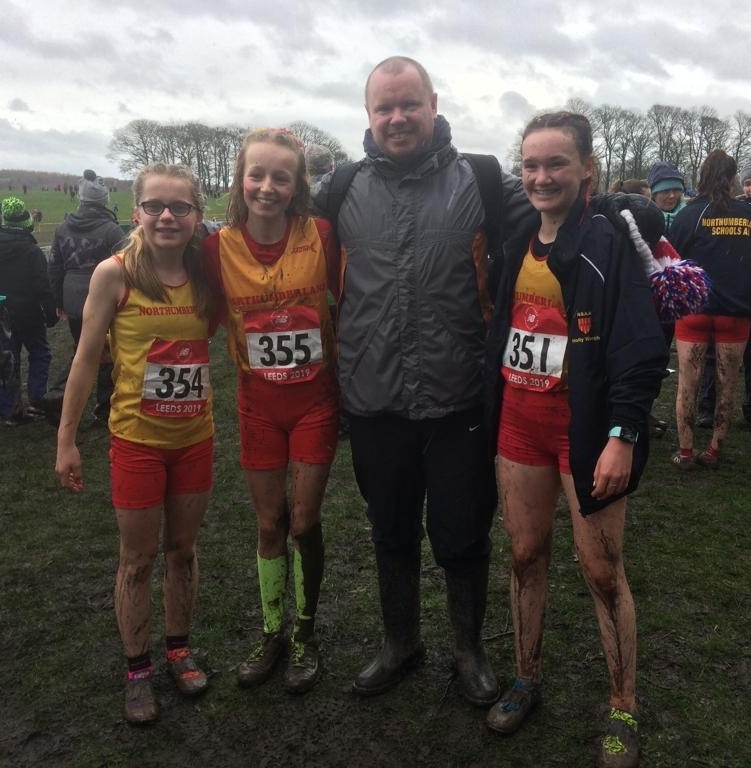 However, our young athletes are a sturdy bunch and a bit of bad weather and some hills were not going to deter our athletes from giving their all and being proud to wear the Northumberland vest. Our 8 athletes were represented throughout three Championships races – the Junior Boys, Junior Girls and Senior Girls. We only had to wait until the second event to see our runners as the Junior Boys Championship took place over 4.1k where we had 3 representatives – Josh Blevins, Oliver Douglass and Zak Old. After the usual manic start, the runners settled down and it was no real surprise to hear the tannoy announcement of ‘in the leading group we have……..and Josh Blevins of Northumberland’. Josh was part of a group of 3 that broke away early on then hung valiantly for the silver medal. The title went to Suffolk’s Lewis Sullivan with Josh just 9 seconds behind and an England vest in the bag! Behind him, things were very manic to say the least. The intensity of the English Schools is second to none, miss a breath and 10 people will pass you, it really is a sight to see. Oliver Douglass finished 143rd and 5th Northumberland counter but was only just over 30 seconds from a top 50 spot. Zak Old, still a newcomer to the club, dug deep despite finding the conditions tough to finish in 286th. 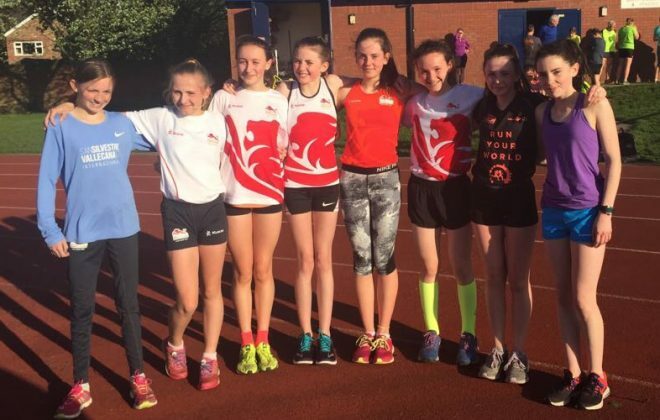 While Josh was getting presented with his silver medal and getting kitted out for his England gear, the Junior Girls took to the stage for their Championship over 3k, where again we had 3 representatives – Holly Waugh, Ellie Van der Merwe and Willow Morris. The three girls have been amazing in training and were really enjoying the whole English Schools experience. Little separates them in training and that was also the case with these Championships, although the results may suggest differently. Holly was first home as 3rd Northumberland counter in 110th place. Similarly to the boys race, the runners were coming across the line in their droves. Holly was only 2 seconds from a top 100 place and amazingly only 32 seconds from a top 30 spot. Ellie was next in 177th, just 17 seconds behind Holly and 5th Northumberland counter. Willow, despite having a fall and being caked in mud at the finish, provided back up to the team, a further 27 seconds behind Ellie. The girls were full of smiles at the end and surely this is just the start and a lot more Championship races will be coming their way. The Senior Girls Championship over 4.1k was the penultimate event of the 6 race program and it was up to Issy Robinson and Cara Blight to fly the Poly flag. They didn’t disappoint either as they both finished as Northumberland team counters. 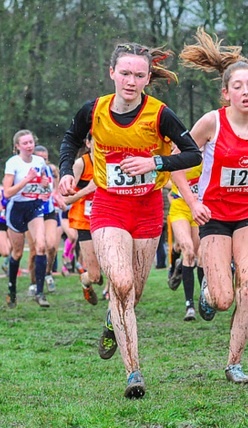 Issy is no stranger to this level of competition, having competed at the English Schools twice before. This will be her final English Schools as she will be at University next year and was rewarded with 240th place with a solid run. Cara was originally a reserve and only got the call up from the Northumberland team manager on Tuesday but justified her place as 6th counter for the team. This was Cara’s first experience of this level of competition and she held her own in 250th, just 7 seconds behind friend and rival Issy. 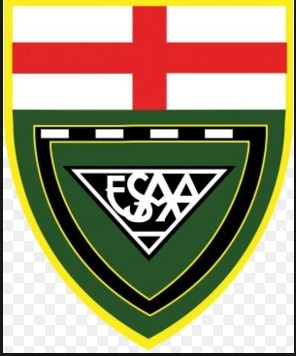 The English Schools has been the springboard to many an athlete’s success. It’s an event that the likes of Brendan Foster, Steve Cram and Mo Farah have all competed in and it was great to see so many of our young athletes competing at this level. We will continue to develop the youth of the club and give them every opportunity to have a successful career for years to come. Finally a mention must go to the parents and supporters who turned up to assist the team in the wind, rain and mud. Whether it was carrying bags, holding kit, changing spikes, putting gaffa tape on spikes, encouraging the runners around the course or simply being a friendly face at the end of a brutal race, it is always appreciated – we are all part of the team.